Kilifi Bay Beach Resort allows you to experience the best of Kilifi. The Resort has beautiful location with breathtaking views of a never-ending beach and the Indian Ocean. With only 50 rooms our emphasis is on personalized service ensuring our guest receive the very best we have to offer ….. we even offer a free massage service for all our guests ! Kilifi Bay is the perfect resort for those looking for a quiet atmosphere and to enjoy the Kenyan coast the way mother nature designed it ! 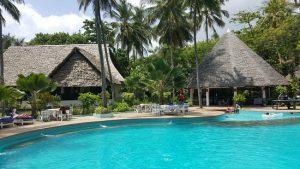 Location The resort is situated in Kilifi, an old coastal town halfway between Mombasa and Malindi. The property is set on 26,000 sq.meters of tropical gardens and 130 meters of sandy beach frontage on one of Kenya’s most beautiful coastlines. There are no other hotels on this stretch of beach, allowing complete privacy. 2 swimming pools: – a small pool near the reception and a larger main pool set in the middle or the resort. 3 bars: – one in the lounge near the reception, the second adjoining the main pool and the third at the beach. 2 restaurants: – one main dinning room located near the lounge, where breakfast, lunch and dinner are served. The cuisine is international and there is normally one barbecue and one theme night a week. There is an a-la-carte restaurant which also serves snacks throughout the day. Lounge: – with television and video. Conferences and seminars: – of up to 80 pax can be held in the lounge. Banqueting: – outdoor: cocktail style, up to 200 pax. Sit down meals, up to 150 pax. Indoor: – cocktail style, up to 150 pax. Sit down meals, up to 100 pax. Sports and leisure Snorkeling, windsurfing, scuba diving, glass bottom boat, big game fishing, cruises in the creek. Darts, table tennis, baby football, billiards, beach volleyball and bicycles for hire. Daily animation program. Acrobatic shows, discos, live music and Traditional African shows at the large outdoor amphitheater, near the small swimming pool. Massage room: near the main pool. Other services: Baby cots, baby sitting, Boutique, Car hire, Currency exchange, Doctor on call, Laundry/dry-cleaning, reception with fax, telephone and safe deposit boxes, room service from 7.00am to midnight, Safari and excursion desk, special meals. A stay at Kilifi Bay Beach Resort’s sister property the tented “Fig Tree Camp” in the famous Masai Mara, Kilifi Bay Beach Resort and Hotel La Mada in Nairobi can be organized at special rates. The vicinity Kilifi is a small picturesque town that developed because of its natural harbor and creek. It is self-sufficient with fruit markets, small shops, two banks, a post office, a pharmacy and a hospital. Teppanyaki restaurant: This restaurant is not party of the all inclusive and it serves different types of sea foods menus. Excursion: We have different types of excursions organized from the hotel e.g Mombasa tour,Malindi tour, and kilifi tour. Baobella boat ride: Ride through kilifi creek with our baobella boat at euros 30 per person for one and a half hours inclusive of soft drinks and snacks. Coconut bar: The only one of its kind floating by the beach. Dine and drink as you experience the breeze from the ocean.Special dinner served every Saturday at the floating restaurant. Animation;Different animation program organized everyday to make a busy day for the clients e.g, water gym, beach volleyball, table tennis,darts,bush walk etc.